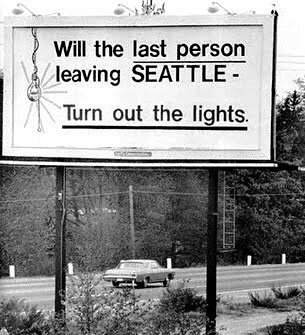 In the early 1970s Seattle appeared to be in a world of hurt. Its double-digit unemployment was more than twice the national average. The Economist magazine called it the “City of despair” — “a vast pawnshop, with families selling everything to get money to buy food and pay the rent”. Like Seattle then, aren’t we in a world of hurt now? After all, the economic headlines of today remain filled with warnings about global central banks—including the Federal Reserve (Fed)—having “run out of tools” to jump start economic growth. Near-zero interest rates here and negative rates in Japan and across Europe only prove this point, some argue. Meanwhile, many prognosticators have had their confidence shaken as their expected growth locomotives for the world, the so-called BRIC countries (Brazil, Russia, India and China) have generally either come off the growth rails or are growing much slower than anticipated. The associated commodity super-cycle and emerging markets century have proved much less durable investment trends than Wall Street expected. As a result, the architecture underlying many of the investment ideas they’ve heavily marketed—wide asset allocation and ‘alternative’ investments (commodities as an “asset class”, hedge funds) —generally continue to flounder. The refrain from other influential policymakers is that we are destined to a world of economic stagnation. It is widely expected that the next generation within the U.S. will suffer a fall in their standard of living compared with that of their parents. Other pundits articulate the broader view that capitalism itself is finally proving to be the zero-sum, fatally-flawed system that “enlightened” thinkers across the ages have warned would prove to be the case. Economic confusion, shaken confidence and a sillier-than-usual ‘silly season’ for domestic politics marks the prevailing environment. What’s an investor to do? For some perspective, let’s return to Seattle…for the rest of the story. Its fortunes since 1971 proved much brighter, of course, than the billboard sentiment reflected. In the late 1970s Bill Gates and Paul Allen relocated their fledgling Microsoft to the Seattle area. Homegrown Amazon came onto the scene in 1994. And it wasn’t just “tech” companies that drove the transformation, or a few tech executives that prospered from it. Service sector jobs (and pay) expanded smartly as the region prospered. A coffee roaster named Starbucks was founded not long after the Seattle billboard appeared. Costco, in another seemingly mundane industry—retailing—was also established a few years later in a nearby locale. Seattle, a “city of despair”?1 Far from it. Why did Seattle’s fortunes shift? Did it just get lucky? Did policymakers at the local or national level employ just the right tools to solve the early 1970s problems? Luck and policy decisions may well have played supporting roles in the transformation. But innovation and new ways of doing things were the ultimate driving force behind the progress in Seattle. Seattle is but one instance within a larger story of the transformative power of innovation. We have examined this innovation story before, but feel compelled—by the pervasive confusion about what drives economic growth—to examine it yet again. For most of human existence life was short, brutish and hard. “To the victor go the spoils”—was the primary way to accumulate wealth in the zero-sum world preceding the industrial revolution. A precarious hand-to-mouth standard of living for most people persisted for centuries. Chart 1: “Go with what economic system works”? The history of market-based economies shows what works! 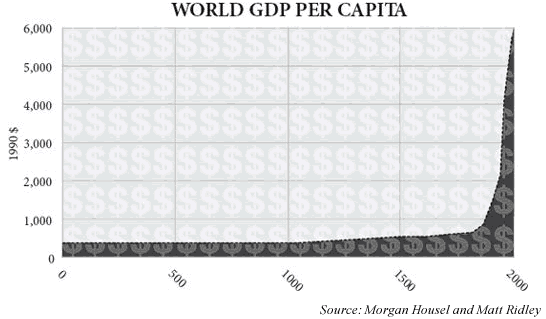 As Chart 1 reflects, things began to change in a massive way about two hundred years ago. Economic historian Walt W. Rostow called it the great take-off into sustained economic growth. ”“Life is better now than almost any time in history. More people are richer and fewer people live in dire poverty. Lives are longer and parents no longer routinely watch a quarter of their children die. The reasons why the dramatic transformation came about have received increasing examination in recent years. Phelps and Deaton offer two such inquiries. In addition, economists and historians Jerry Muller, Joel Mokyr, Deirdre McCloskey, and Robert Higgs also have written insightful books about this period. New respect for the individual and social acceptance of those who became financially successful (McCloskey calls it “dignity for the bourgeois”). Acceptance of voluntary trade based on mutually beneficial transactions. (Emergence of the attitude: “Do what you do best and trade for the rest”). Social acceptance of risk taking and tolerance of commercial failure (Emergence of the attitude: “If at first you don’t succeed, try, try again”). Increased acceptance of creative and original thinking in science and commercial endeavors. Many of these conditions meant significantly increased freedoms for individuals. The power of laissez faire—“letting (people) free”—unleashed human ingenuity unlike ever before. Free market economics emerged. The free market system also triggered a democratization of the economy and economic success. Markets judged an individual’s product or service on its value-added merits—not on the innovator’s familial lineage or pedigree. The profit and loss system, the price mechanism and competition underlying free markets also enabled constant experimentation and essential feedback, in the search for “what worked” best in satisfying needs and desires. It became possible—on a scope and scale never witnessed before—to create wealth by pleasing others. Centuries of zero-sum economics gave way to an expanding pie of prosperity where all were beneficiaries—especially the poor. Economist McCloskey suggests that the market-based economic process known as capitalism would be better described by the term, innovationism. We believe she has a good point—Innovation (the cause) rather than capital (an effect) more accurately elevates attention on what’s most important in driving prosperity within market based economies. ”“Prosperity on a national scale—mass flourishing—comes from broad involvement of people in the processes of innovation: the conception, development, and spread of new methods and products—indigenous innovation down to the grassroots. The recognition by a people that their prosperity depends on the breadth and depth of their innovative activity is a huge importance. Economist Thomas Sowell points out that some of the largest fortunes in history accrued to those that benefited the masses by making goods cheaper. Some notable “cheapeners” include Ford (autos), Carnegie (steel), Rockefeller (oil), Sears, J.C. Penney and Walton (retail goods). 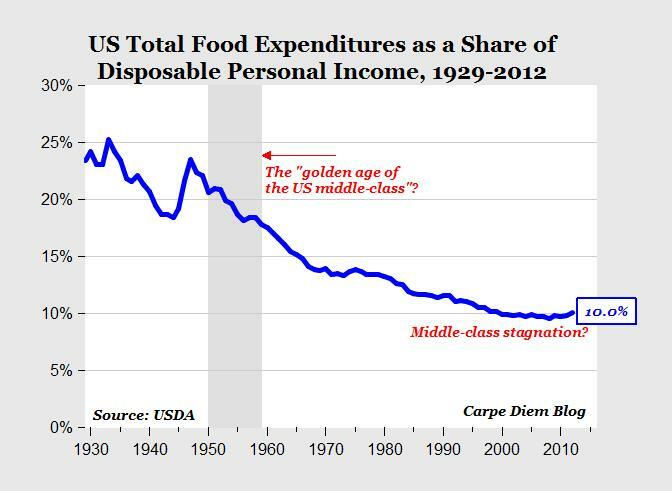 Chart 2: More affordable food—the trend continues! Finally, innovationism enabled increased leisure time, longer life spans, and the automation of mind-numbing, back-breaking jobs. These factors, likewise, significantly contributed to increased living standards. What about the rich getting richer while the poor get poorer? Muller (mentioned earlier) notes that the word capitalism was originally intended as a pejorative term by critics of free markets. Over the years other phrases like “robber barons” and “filthy rich” helped reinforce the negative narrative of worker exploitation at the hands of fat-cat capitalist that forever grow richer. Karl Marx and Fredrich Engels detailed their theories of worker exploitation in their writings. They, and many others since, warned that the “happy idiot’s struggle for the legal tender” (as rock and roller Jackson Browne put it in the 1970s) would impoverish workers both physically and spiritually. The crushing grind to make a living would stunt the human potential of workers, according to Marx. Reality intruded on their theories. For as Marx and Engels were developing their ideas, innovationism was busy unleashing the amazing transformation depicted earlier in Chart 1. Most important of all, the transformation brought with it unprecedented advancements in the general standard of living for the ordinary man and woman as we alluded earlier. Reality intruded on theory, yet again, as real-world experiments in creating the “workers’ paradise” along the lines envisioned by Marxists were undertaken in the U.S.S.R, Mao’s China, and more recently, socialist Venezuela. The reality was anything but paradise. The modern versions of the negative narrative revolve around the notion that the rich are getting richer while the poor get poorer under innovationism. Let’s turn back to economist Sowell who has studied this topic in detail.5 He notes that the mobility (both upwards and downwards) within income categories by individuals is much more dynamic than generally understood. The mobility becomes evident when the earnings of individuals are tracked over time. A University of Michigan study followed specific U.S. workers from 1975 to 1991. It found that particular individuals who were in the bottom 20 percent in terms of income saw their real incomes rise at a much higher rate than those in the top 20 percent. The second study, this one by the IRS, covers the period from 1996 to 2005, and provided a similar result. Workers whose incomes were in the bottom 20 percent saw their incomes nearly double. Over the same span, those in the top one percent saw their incomes fall by 26 percent. ”“What percentage of American households have incomes in the top 10 percent? Answer: 51 percent of American households are in the top 10 percent in income at some point in the course of a lifetime—usually in their older years. Those who want us to envy and resent the top 10 percent are urging half of us to envy and resent ourselves. The economist Mark Perry examines the claim that the middle class is “losing ground” under innovationism. Chart 3 tracks household income over time. 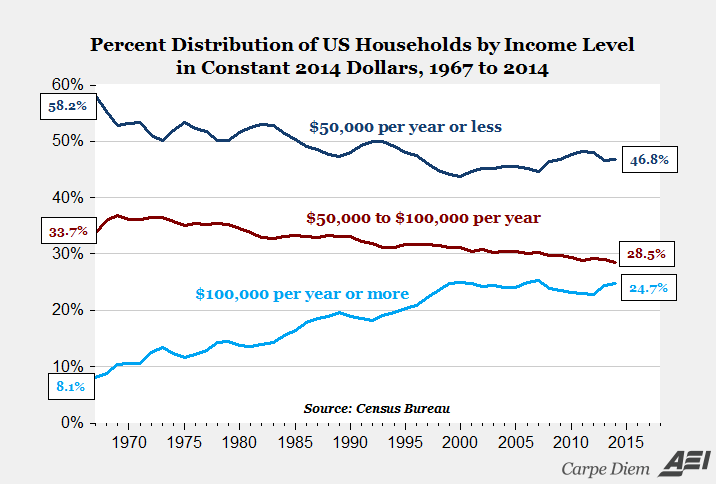 It reveals that the share of American households earning $100,000 or more per year (in 2014 dollars) increased more than three-fold from 8.1% in 1967 to 24.7% in 2014. Shifting back to Sowell; he argues that another source of confusion in discussions of economic differences is the failure to distinguish between income and wealth. The use of the term “the rich” to describe people in higher income brackets is just one sign of confusion. Being rich means having an accumulation of wealth rather than having a high income in a given year. This distinction is important. Calls for raising income tax rates to make “the rich” pay their undefined “fair share” are an exercise in futility because income taxes do not touch wealth. Higher income taxes are a tax on people trying to accumulate wealth. Wealth is also dynamic under innovationism. The saying “shirtsleeves to shirtsleeves in three generations” is part of the dynamic. But, it is also due to the dynamism inherent within innovationism as well. For example, in 1982, when Forbes first published its 400 “richest” list, 60% of its members represented inherited wealth. Subsequent lists showed consistent and widespread turnover among the members. In recent years 70% of the list’s members founded the businesses that generated their wealth. Innovationism is not perfect of course. With people at its core, it reflects the imperfection of human beings. Some people cheat, lie and steal. This is where the rule of law and some government regulation must come in. Also, concern about special interests seeking favors from “friends in high places” is a very real issue. Businesses and vested interests wishing to preserve the status quo often seek to limit competition that may threaten their profitability, if not their very existence. Regulations, quotas, subsidies, licensing requirements and other favors from “friends in high places” often provide barriers that stifle market competition and innovationism. As a government expands in size and its reach into an economy, the risks and rewards of cronyism only increase. But is innovationism really to blame for this state of affairs? Like the two men that dreamed up the 1971 Seattle billboard, we believe domestic economic prospects hold more promise than generally believed. Yes, economic growth is slow. Wet blanket tax and regulatory policies from Washington don’t help matters—neither does weakness around the globe as China’s boom continues to deflate and the commodity super-cycle bust plays out. Persistent fear, uncertainty and doubt as fallout from the 2008 Financial Panic dampen economic “animal spirits” and also weigh on U.S. growth. Still the economy grinds forward displaying resiliency. The silver lining in the slow-growth pace is that serious excesses (inflation and private sector debt) that render economic expansions vulnerable to recessions remain largely absent. Inflation remains low. The banking system is better capitalized than it has been in decades, consumer debt burdens are modest, and most companies are flush. And while the Fed is slowly shifting gears, policy is only moving from “ultra-expansionary” to “extremely-expansionary”. In addition, domestic demographics are transitioning from a headwind to a tailwind as household formations rise, employment increases, and energy costs fall. These trends augur well for housing and home furnishings, auto sales, and new business formation. Most importantly, conditions remain ripe for innovation. More minds than ever, armed with new technology enabled tools, are busy figuring ways to make life better with product and service innovations. Cloud computing, big data, the internet of things, simulation software, 3-D printing, direct digital manufacturing, advances in material sciences and medicine, the evolution of new payment systems, artificial intelligence, quantum computers—combined— these developments represent a powerful cocktail for significant innovation…and investment opportunity. Several of our portfolio companies are at the forefront of these developments. PTC is working to revolutionize preventive maintenance by marrying the digital and physical worlds through the so-called “internet of things”. Proto Labs and Ansys are enabling engineers, tinkerers, and inventors to cut research and development time and expense by speeding up product design and production. They are bringing the power of unprecedented computer horsepower to the desktop. Efforts that had required weeks of computational time can now be done in hours or less at a fraction of the cost. Fiserv is helping banks cope with the rapid changes in the way people bank and transact payments. Paypal, Fleetcorp, and Verifone are forging the evolution in payment systems from other directions. Alphabet (Google) continues to help companies transition to a new world of advertising and has considerable resources trained on several “big” potential markets including healthcare, communications, and next-era quantum computing and machine learning. On the more mundane side perhaps, Ecolabs is helping restaurants meet increasing stringent health standards, while also helping them control costs by reducing water and electricity usage. It is aiding hotels to be free of bedbugs. And like several other portfolio members, it’s working on clean water technologies to help solve global water problems. ”“Any sufficiently advanced technology is indistinguishable from magic. These portfolio companies are using innovation to grow within a growth-starved world. And they are doing so while generating abundant free cash flow and maintaining strong returns on capital. Their stock prices may ebb and flow on the daily emotions on display within the financial markets, but their values are ultimately aligned with the fortunes of their underlying businesses. Economist Tyler Cowen notes that innovation pessimists essentially argue that productivity cannot meaningfully advance from here because they cannot imagine what new things might create gains. The magic quote above suggests why it is so hard to “see” the new innovations before they make an impact. 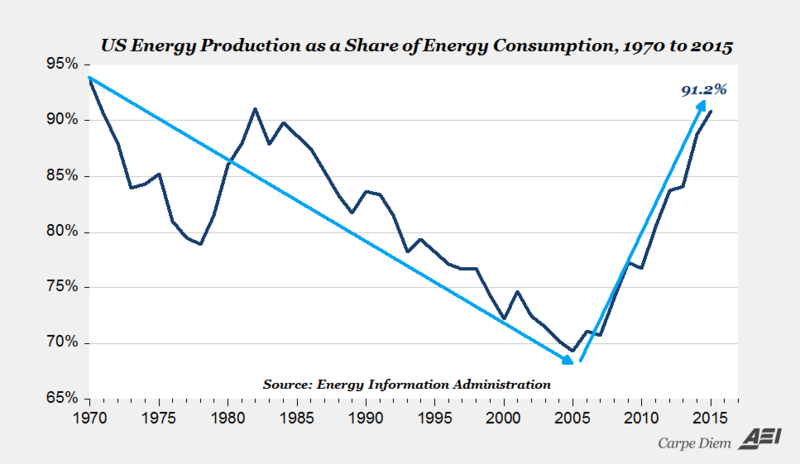 Consider also what has occurred in energy production in recent years. Seemingly out of nowhere the worldwide energy equation has been upended. Why? A few intrepid petro-entrepreneurs kept experimenting with new drilling techniques. Their innovations unleashed significant new supplies. 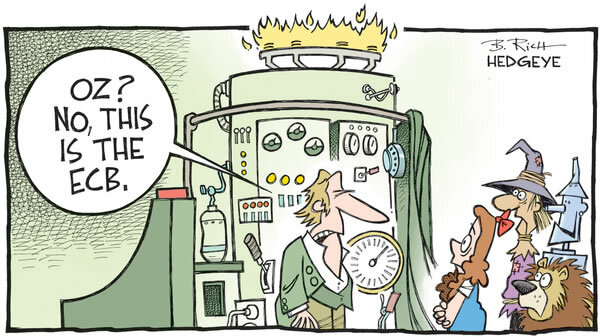 This was occurring while many experts were embracing the notion of “peak oil”. By the way, innovators are at it again and another phase of the energy revolution may be brewing. Still more innovative drilling techniques are on the way that may allow oil fields once thought depleted to become sources of new significant supply. ”“There are notions so foolish that only an intellectual will believe them. For decades the spokesman for a hotel chain ended its commercials with “I’m Tom Bodett, and we’ll leave the light on for you”. There are no snappy commercials for innovationism—but it is leaving the light on for us all—as investors and citizens. The ride ahead may well be bumpy, but the rewards should make it worthwhile.